Bluesman AL LERMAN is a multi-instrumentalist, singer, and songwriter. He was founder and leader of the 2X Juno Award-winning band FATHEAD, and along the way built a solid career touring as an acoustic solo act, accompanying himself on guitar and rack harmonica. An engaging and skilled artist, his shows often feature humorous anecdotes interspersed between great blues songs. 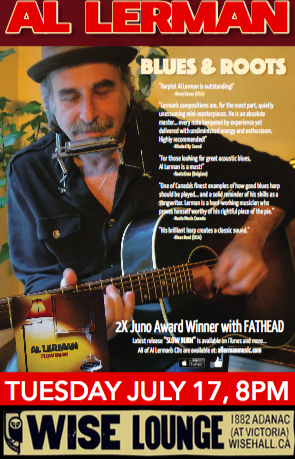 He is regarded among the top harmonica players in the country and his prowess on the instrument has earned him no less than ten Maple Blues Award nominations in that instrument category. He has been heard on countless recordings and live sessions with some of the best in the blues. In 2016 his standout “Slow Burn” disc made the esteemed world-wide list of Top 100 Blues Albums Of The Year. That same year he also garnered a Maple Blues Award nomination for “Acoustic Act Of The Year”. In 2017 he received a Recognition Award for “Leadership In Arts & Culture” from the County of Peterborough. A full-time musician for over forty years with an impressive catalog of well-crafted songs, Al casts a magical spell on his audience wherever he goes.